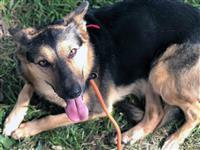 Eloise is a beautiful 45 pound German Shepard mix. She lets you manipulate her paws, mouth, legs etc without a peep. She is eager to learn and please. She's a sweet girl. What she needs is a structured home where she'll feel secure and not need to be in control. Once she trusts you and understands that certain behaviors are expected of her, she's right on board and tries hard to remember that! Because she's currently in our kennel, she isn't getting that structure and training consistency. We recommend no kids for the first year as you bond and work together. Kids in the home would probably be too much distraction, though she likes them. She'll also do best in a home that likes paws on the floor (no beds or sofas) because that will help her learn your house rules and feel better about her role. 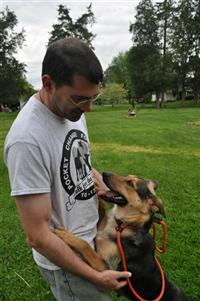 A dog companion may be ok during that first year with the right dog and introductions. No cat siblings though.